When you watch a film for two hours or so it’s easy to forget the weeks, months and years of intense work that went into the making of it. 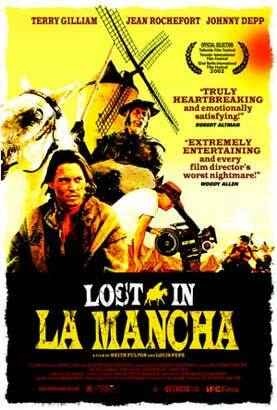 In the case of maverick director Terry Gilliam (Brazil, The Fisher King, The Adventures of Baron Munchausen etc.) adapting the legendary story of Don Quixote by Spanish author Miguel de Cervantes for the screen consumed over a decade of his life. But just as it was for Orson Welles before him, the fantastical 17th century tale of an elderly nobleman deluded into living the life of a heroic knight would prove nigh on impossible to shoot. Luckily for us two documentary makers were on hand to commit to celluloid the harrowing and often hilarious attempt. Co-directors Keith Fulton and Louis Pepe who previously made the behind-the-scenes documentary about Gilliam’s film Twelve Monkeys once again had unlimited access to ‘Captain Chaos’ and his crew during pre-production and the first fateful week of actual production when everything that could go wrong did, and then some. On Day One, the first location, four hours north of Madrid, reveals itself to be a NATO bombing range regularly criss-crossed by F-16 fighter jets. Recording sound to match the period setting is out of the question but that is nothing compared with Day Two when the heavens open up in a monumental way washing away the entire set, cameras and all. By Day Five the leading man, French veteran Jean Rochefort can hardly walk let alone ride his trusty nag due to a prostate problem and his co-star Johnny Depp is looking decidedly nervous. Insurance personnel call it an act of God. Director of Photography Nicola Pecorini calls it the worst luck he’s seen in his 22 years on the job. ‘If you wrote a script with all the bad things that could happen, you couldn’t make this up’, he despairs. Yet it is Pecorini who sees a lesson in amongst all the mayhem. ‘He lowered his targets,’ he says of Gilliam. US$32.1 million might have been the biggest budget for a feature film using only European funds but, as Gilliam himself said, it was only half the money they needed to realise his wild and woolly vision. In the end the film was abandoned and all the eccentric props and costumes were packed away into storage. Co-writer Tony Grisoni viewed this tragic outcome as a bigger reflection of the quixotic tale itself in which reality ultimately triumphs over the protagonist. In the case of this ill-fated film, reality squashed the fantasy. Nevertheless one marvellous screen test survives as a theatrical trailer of sorts to entice future investors and audiences. It features three wonderfully grotesque Spanish men cast as the films notorious ‘Giants’, figures who, in the mind of Quixote morph out of windmills to terrorise him. Shot from below the ‘Giants’ are seen galumphing through the landscape before converging on the camera with cannibalistic delight. A simple graphic reads ‘Coming Soon’ accompanied by Gilliam’s infectious if somewhat mental laugh. Here’s hoping!